Stavesacre is a Southern California-based rock band that, despite some key lineup changes and the vagaries of the music business, has endured for more than a decade. Stavesacre debuted in the mid-1990s with three well-received studio albums on Seattle-based Tooth & Nail Records, a period when the group was associated with the edgier side of the contemporary Christian music scene. But dissatisfaction with what the band saw as hypocrisy in that industry led to a well-publicized break from the scene. The band's first three albums sold a combined 90,000 copies. In 2002 Stavesacre signed with the independent Nitro Records and released (stavz'a'ker). The band then sought release from their contract and went fully independent for the release of a live DVD of a show recorded in Dallas, Texas, in 2002 plus the four-song Bull Takes Fighter EP. 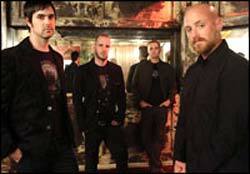 In 2005 the band signed with Abacus Recordings, an imprint of Century Media Records, and recorded its fifth full-length studio album in Los Angeles with producer Matt Hyde. Titled How To Live With A Curse, it was released on April 18th, 2006. Mark Salomon was the vocalist for the thrash and punk rock band The Crucified. He also had a punk rock side project called Outer Circle and has appeared on other records with Native Son, Mortal, Chatterbox, Project 86, Argyle Park, and AP2. He is the author of Simplicity (published by his own Skeleton Key Publishing and reprinted by Relevant Books), an autobiography which explains why Stavesacre has left the "Christian" label behind in order to more effectively fulfill what they believe God is calling them to do.